This is a very fine and sophisticated jasmine tea. Tea Leaves Origin: tea sprigs of single plant or one sprig plus one small leaf from Fu Zhou 福州. Jasmines buds are picked between every July and August. Craftsmanship: we first need to prepare tea base 茶底. We use tea leaves which are suitable to make white tea. 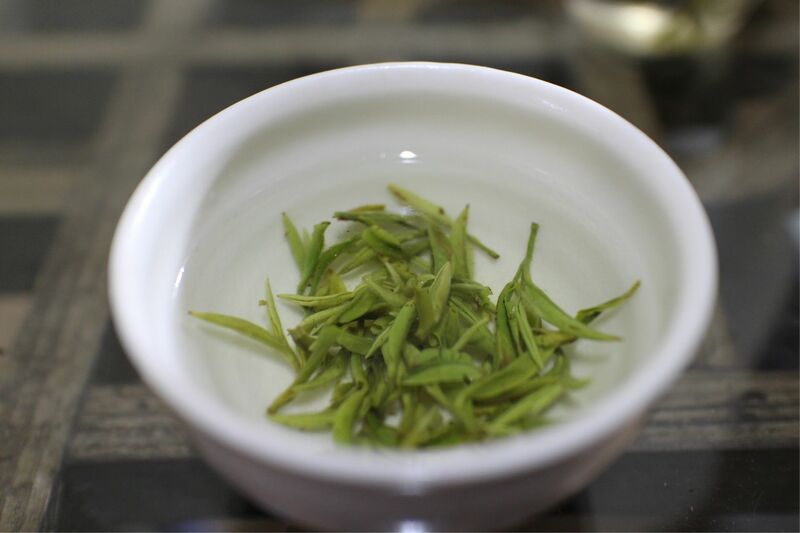 However, we process these white tea leaves with the method which is used to make green tea. 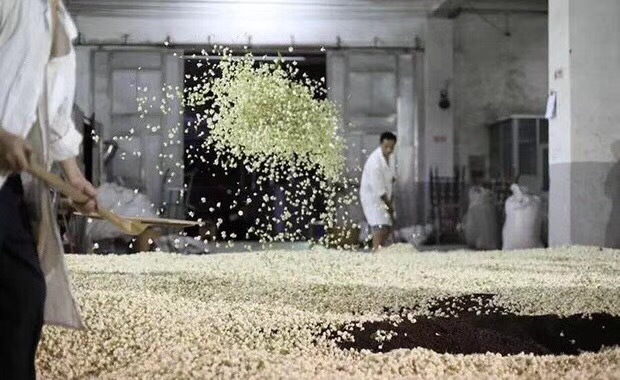 This is how we prepare our tea base for jasmine tea. 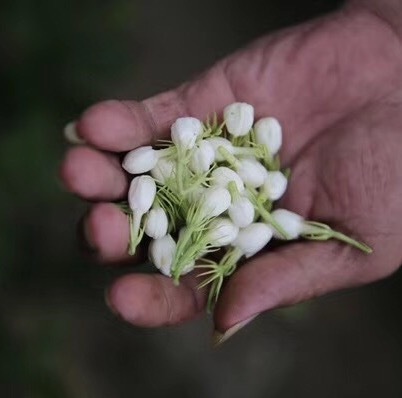 When jasmine buds are ready, we pick these buds between 3:00 and 4:00 in afternoon. Around 1:00 to 2:00 a.m. next day morning, jasmine buds are opening. At this moment, very strong aroma is released suddenly. 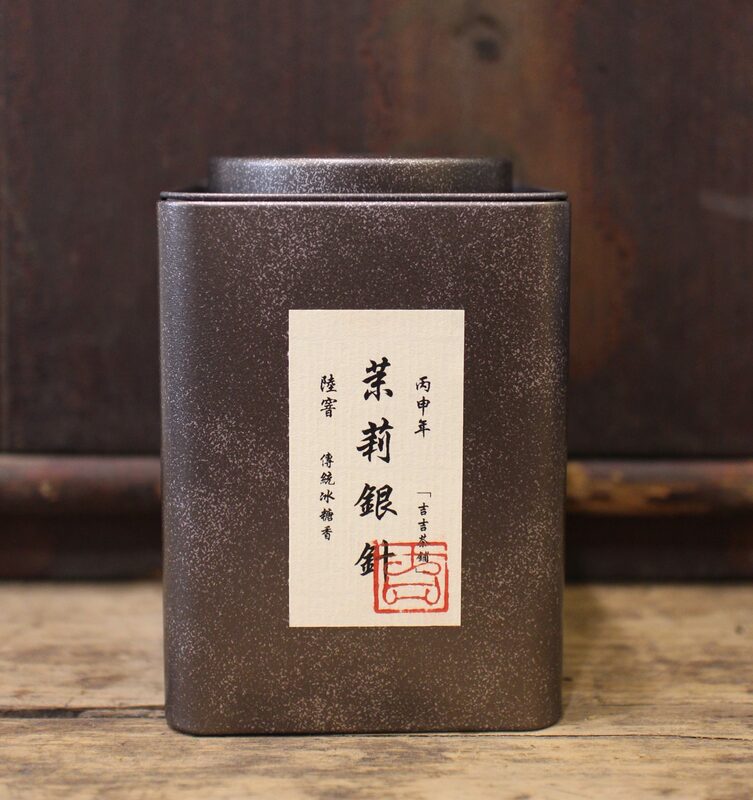 At this moment, we put the opening jasmine buds and tea base together so that the tea can be marinated thoroughly with jasmine flowers, absorbing their aroma. When the marination is completed, we need to separate jasmines and tea. Then we start this process again with fresh jasmine buds. This jasmine tea at our Inkston Studio is marinated 6 times with jasmine flowers. Low cost jasmine tea is tea mixed with jasmine flowers in the packet. However, in high end jasmine tea the flowers are not left in, except for a few petals. Only the aroma stays behind, making the tea smell absolutely fantastic! Taste: very rich jasmine aroma, sweet, and a little bit bitter. 3gram tea leaves can make sufficient tea for one afternoon. Colour of brewed Tea: light yellow. Green Tea is not fermented so it largely retains the flavours and nutrients of the fresh green tea leaves. The leaves and brewed tea are mostly green hence it is known as ‘Green Tea’. In china it is very popular to keep sipping hot water a few green tea leaves in it throughout the day. 茉莉花 Jasmine We use Jasmine buds to marinate tea leaves. We pick these buds between 3:00 and 4:00 in afternoon. Around 1:00 to 2:00 a.m. next day morning, jasmine buds are opening. This is when jasmines reach their best performance. To make premium jasmine green tea, we need to marinate tea leaves at least 6 times. Each time, we use fresh jasmines and after the marination is finished, we remove the used jasmines and replace them with new jasmines.